Last week's Black Friday and Co-op Sale might have left me a little on the outside looking it, but that's fine. Sony now has four weeks of holiday sales to hopefully deliver something I can proudly waste my money on. Without further adieu, here's what you can expect to find on sale this week. Any winners in this bunch? Ehhh, nothing that I don't already own. Maybe I'll pick up South Park: The Stick of Truth someday, but I'm a little RPG'd out at the moment thanks to Dragon Age and Persona Q. What do I recommend here? Guacamelee is one of the best indie games of recent years, and it is a bona fide winner. I recommend it every time it goes on sale, and naturally, this time is no different. Velocity Ultra is also a wonderful little game definitely worth the $3 you'll be paying for it. Sadly, it does not support cross-buy, and it makes for a better burst of gaming on the PS Vita. And what kind of warm-blooded JRPG fan would I be without recommending Tales of Symphonia? Readers might know I am not the biggest fan of the Tales series, but even I have to admit that this entry is a stellar game and easily the franchise's high point. This sale also gives you the ability to split the Tales of Symphonia Chronicles HD bundle right down the middle and buy this game separately from its maligned sequel. Be sure to do so. 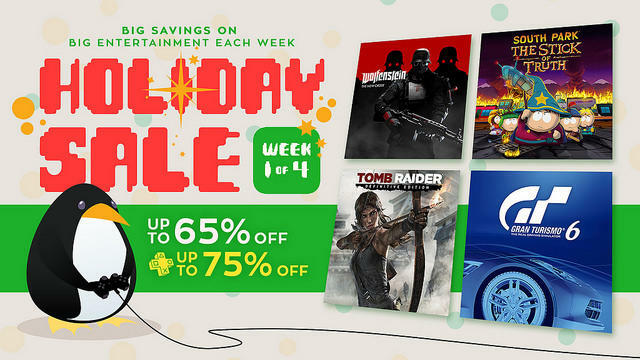 The rest of the sale is fine with a few big titles like Tomb Raider and Gran Turismo 6, but I'm going to hold out for next week. My recent resurgence with the Persona series has put me in a position to really want to play Persona 4 Arena. Maybe it will turn up. Atlus hasn't had a sale in a month or two.